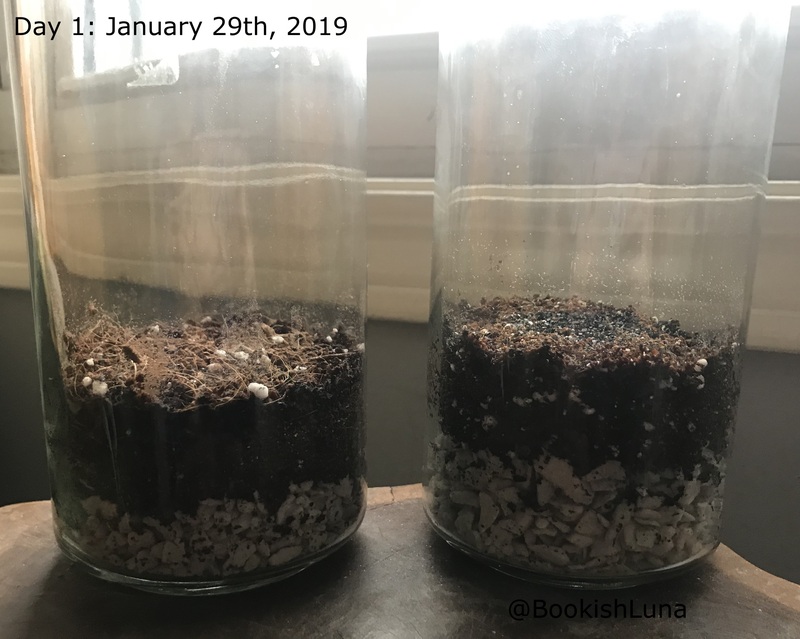 Welcome to the second month of my indoor garden adventures, if you missed the first installment where I introduce the first terrariums I set up, Indoor Garden Adventures | January 2019. This installment I will update you with how the seedlings are doing and share a new addition I have added to my garden. I will say starting this in January might not have been the best start since I have been trying to keep the temperature nice and warm for my plants, but it has been so cold. Anyway, here are the updates! So, sadly I have an update that is not so good. Then a bit of an upgrade for one of my established plants The first bit of news is my air plant was damaged during shipping. Seemed the heat pack was too hot for the little plant and it was too stressed. I honestly felt horrible. As soon as I noticed something was wrong I thought I already did something to the plant. Turns out I personally did not, but the shipping did not go so well. I was sent a replacement plant, which arrived 2/29/19 and it seemed to be be in better condition. It felt like it had more heft to it and was brighter in color. The second bad news, well not sure if I should call it bad news… my seeds never sprouted like I suspected they wouldn’t. This is true for my outside gardening as well. I can never do seed starters, but if you give me a baby tomato plant I will grow it larger than myself, yes that actually happened to me last year. My plant became bigger than me. I am still not sure how I pulled it off, but I have a green thumb somewhere it seems. 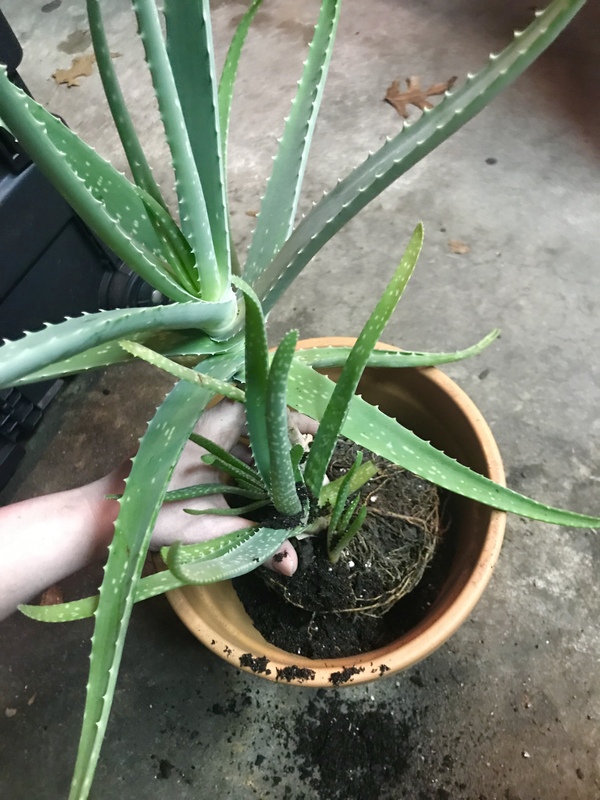 Also, I am happy to say that I have had an aloe plant for years. Sadly it is not able to live in my room because it needs more natural light than it can get in my room with the window I have. Anyway, it has gotten so big! It has 3 pups growing off of it now and I thought it was time to give it an upgrade! I am hoping it does well with the new pot and continues to thrive. So, while I was waiting for my replacement air plant I ended up picking up a grow light for my plants. I wanted them to get as much sunlight as they needed and the weather has been not so great the past month. Every day seemed to be overcast and dark. So I picked up a cheaper one and I am hoping that will help the little ones. What is your favorite plant or flower? Do you have a garden, indoor or outdoor? Anyway, I always want more and more plants, but I don’t have a ton of room for them. But, a few weeks ago I was walking through the store and I noticed that this brand was selling terrarium kits. I thought it would be a great way to start with my current limitations. 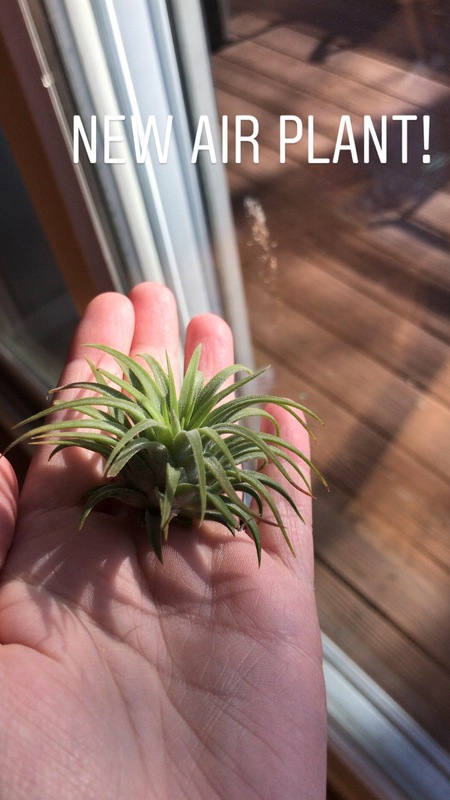 I ended up picking up two different ones because I could not decide, as well as a mister for an air plant I will show in a future edition of this series. Anyway, I picked up a Forest Floor Scandinavian and Forest Floor Woodland. The Scandinavian edition has seeds for a plant called Hyssop and the woodland has Sedum. As you can see the kits came with quite a bit. I had to assemble the layers as well and place the seeds inside. I am very nervous about these because I feel like it would be very hard to grow plants from seeds if you are not very experienced. But, I am going to do my best. The picture below is the first day of the seeds being placed in their new home. It is said that it could sprout from 7-21 days so I have a lot of waiting in front of me. 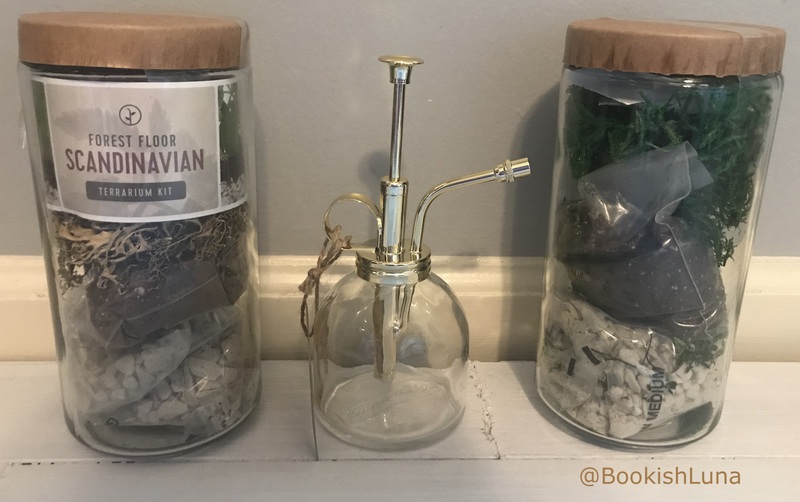 While this is quite a short post I wanted to put together this introduction to this new series on my blog where I am happy to share other interests I have outside of reading. Please wish my plants and myself luck because I am so worried I am going to fail at this and do these little seeds a disservice. Anyway, if you know anything about plants or anything like that please share your knowledge. I could use all the help I can get! So as of late I have found myself wanting to share more and more of my non-bookish hobbies and interests. All around I have found I have been wanting to share more of myself with everyone. While I have previously shared myself trying to find a new hobby in my Find A Hobby Series I wanted to expand more. I wanted to share more about things I enjoy in my life, how I love to cook and create things, and my love of nature. 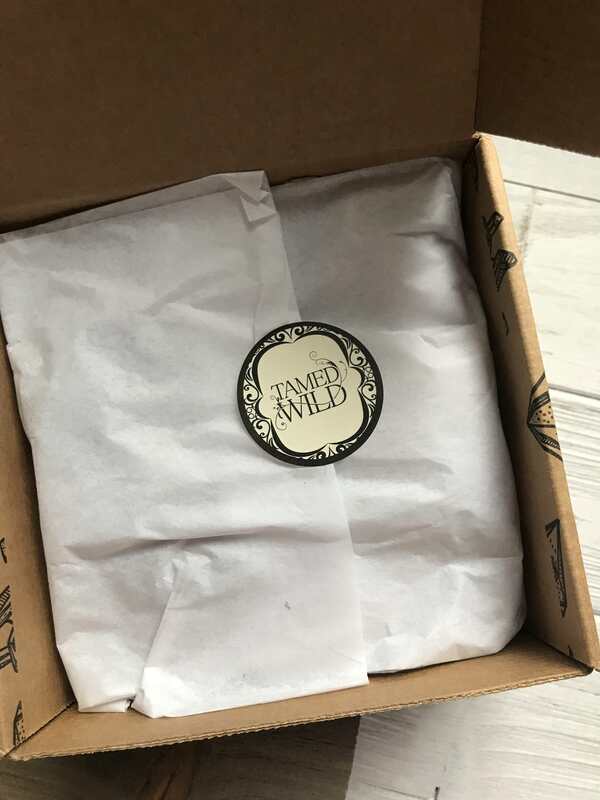 I figured I would start with an unboxing of a subscription box I really enjoy. Since I was a young girl I really loved crystals. My uncle used to go away and go to mines for fun and always bring me back a crystal when he found any. I have really find memories attached to them. To this day I enjoy having them with my for their beauty as well as the affect they have on me. I personally find it relaxing to have rocks, crystals, and other gem stones around me. I feel a connection with nature and I find it soothing. While you may say this is just be a bunch of hoopla, well it may be, but it still makes me feel better and it hurts no one. Anyway, I wanted to share this unboxing. 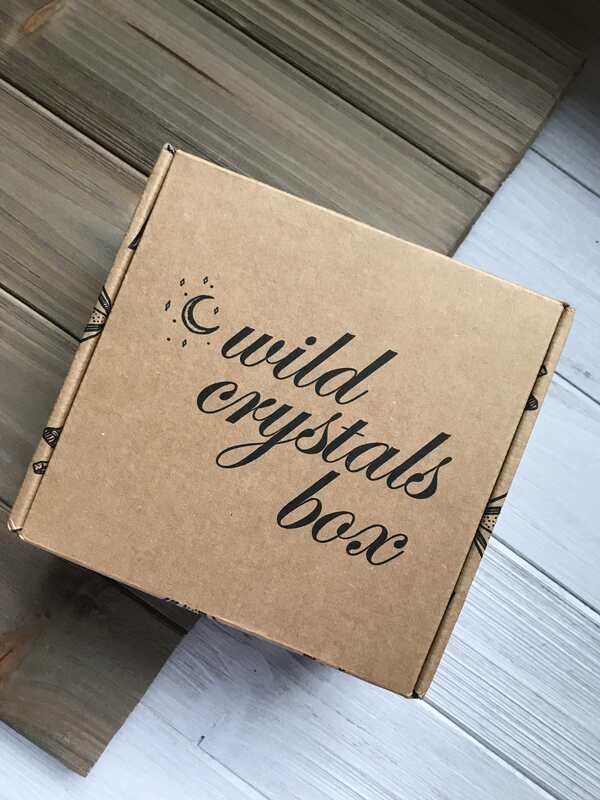 This subscription box sends various crystals every month and explains their significance. I enjoy it not only because I learn about new minerals and crystals, and I get to add to my collection. If you want to know more I will link their website here. I would also like to point out that this is NOT sponsored, I pay for this box with my own money. Here is the box on the outside, I wish I could write in this font. I always want to learn calligraphy, but I never follow through… why? 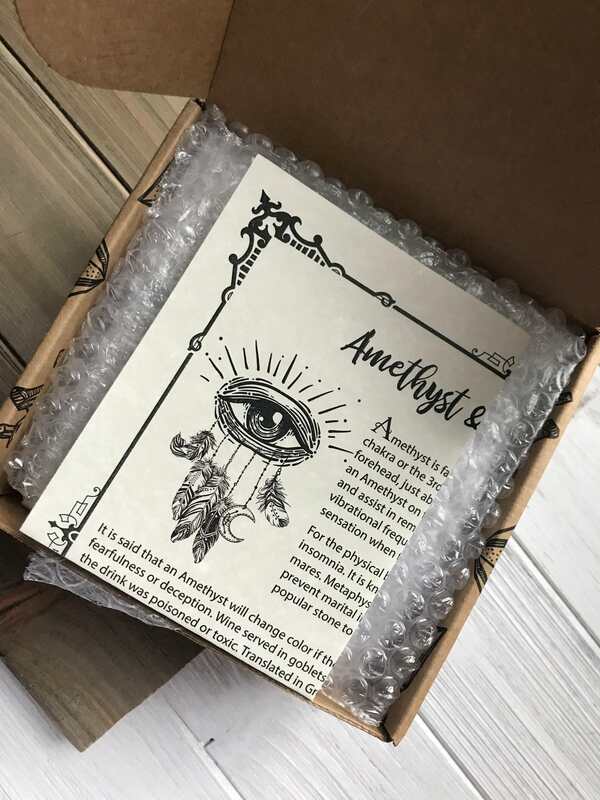 Here is what you are greeted with when you open the box. This sheet is the information sheet about the characteristics of stones in the box. I didn’t want to take a picture of the entire sheet and infringe on their stuff. But, I will say that what they write is very detailed and an entire 8 1/2 x 11 page is always filled with information. When you remove the bubble wrap and information sheet this is what you are greeted with. Once you rip open the wrapping you are met with a jam packed box. 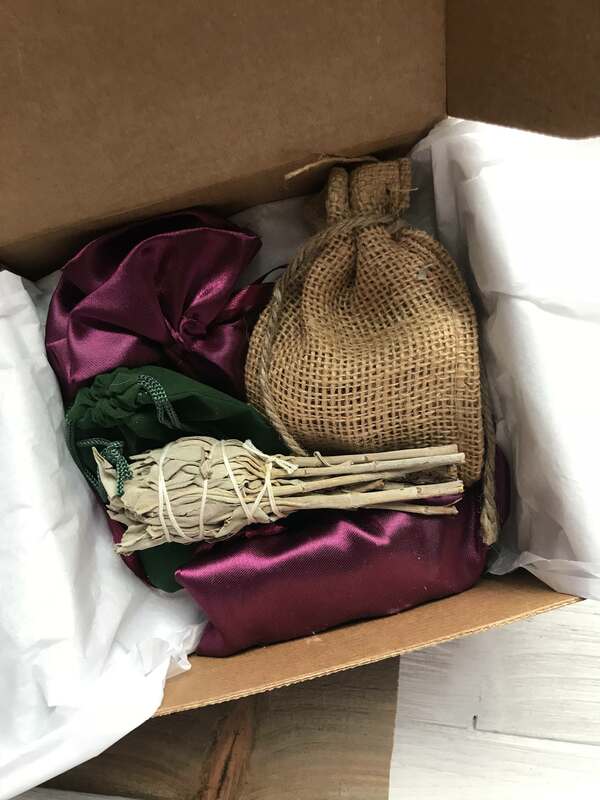 This month I saw 3 pouches with a different item in each and bunch of sage. 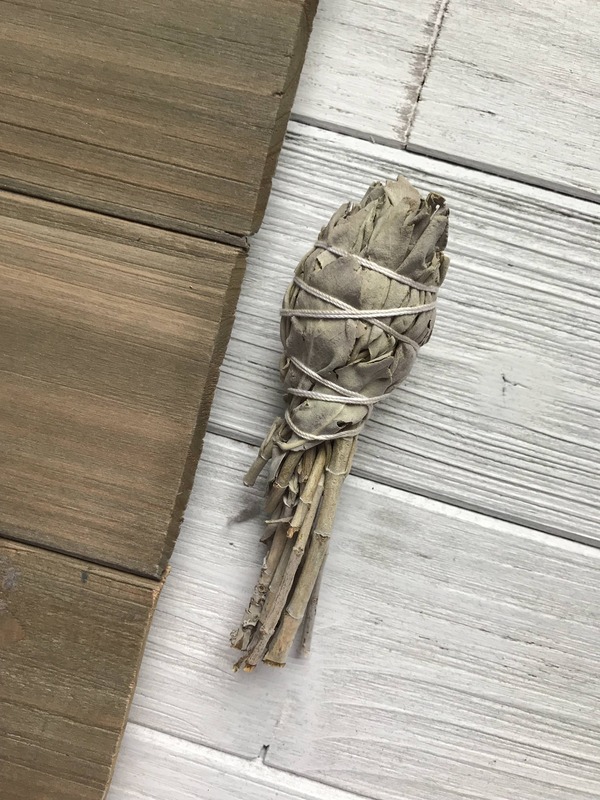 I never burn sage, but I have a friend who does. I am not sure if it is the proper kind or not so I will run it by her if this is the type she uses. If it is not I will keep it because it does smell nice without it being burned. This month each subscriber got a different necklace. 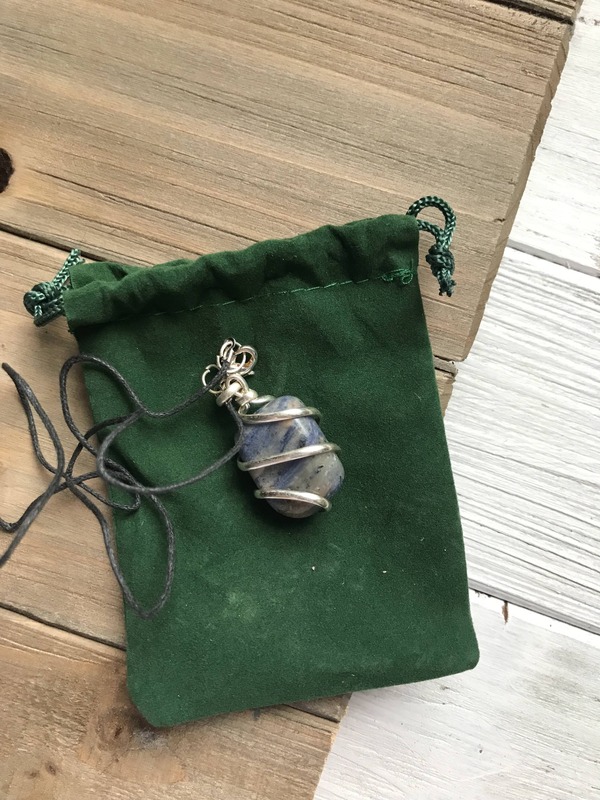 I ended up getting sodalite. I will be doing some research into this stone as well as replace the chain. I don’t tend to mix well with fabric based chains. I do very much like the metal that is holding the stone. In this box I was sent two pieces of Carnelian. These two stones are is very nice shape. They are tumbled well, with no edges. I liked that they added a little history to the fact sheet by sharing that in Egypt it used to be referred to The Setting Sun. The picture does not do the color justice, but I can say I can see why they called the stone this. 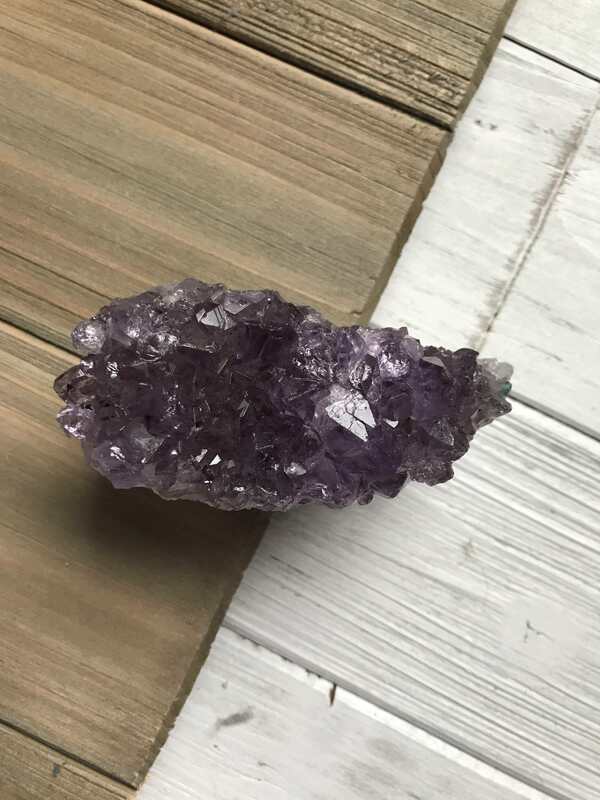 The last item in my box with month was a large and beautiful piece of Amethyst. I love the color of this stone and the angles. When the light hits this one it reminds me of the purple version of the Philosophers Stone in harry potter, the light just dances on its surface. Do you have a collection you keep adding to?